An Air Canada jet takes off from Halifax Stanfield International Airport in Enfield, N.S. on March 8, 2012. Air Canada chief executive officer Calin Rovinescu defended the airline’s offer to buy back the Aeroplan loyalty program it spun off more than a decade ago, saying it’s the only bid that will relieve Aeroplan owner Aimia Inc. of the $2-billion liability represented by the points members have in the plan. "We believe there is no other party out there willing to accept this $2-billion liability nor any other buyers for the company," Mr. Rovinescu said on the airline's second-quarter financial results conference call. He made his comments two days after Air Canada went public with an offer of $250-million for Aeroplan and assumption of the $2-billion in liabilities. The consortium making the bid includes existing Aeroplan bank partners Toronto Dominion Bank and Canadian Imperial Bank of Commerce as well as Visa Canada Corp.
Air Canada spokesperson Isabelle Arthur clarified his remarks by saying that the airline intends to continue offering seats to Aeroplan members after June, 2020, the target date for the establishment of Air Canada’s own program, but they will not be offered at the discounts Aeroplan members currently receive versus other Canadian loyalty programs. And Air Canada has not reached a deal with Aimia on what the rate will be for the seats Aimia purchases to offer to Aeroplan members, Ms. Arthur said. The offer to buy Aeroplan is the latest twist in a saga that goes back to 2005 when cash-strapped Air Canada spun off its loyalty program for $2-billion. Last year, it said it would develop a new loyalty program by 2020, a move that sent Aimia shares plunging. If Aimia accepts the offer, which expires next Thursday, Aeroplan will be folded into the new Air Canada program. If Aimia rejects the bid, Air Canada will resume its negotiations with credit card companies and conclude an agreement in the fourth quarter. Air Canada will set up its own loyalty program regardless of how Aimia responds, Mr. Rovinescu said, reacting to confusion about whether Air Canada planned to proceed with the in-house loyalty program it has been working on for more than a year. Grupo Aeromexico announced an offer to buy Aimia’s stake in Mexico’s leading frequent flyer program on Thursday, but Aimia rejected the US$180-million bid as insufficient. Air Canada believes its loyalty program should have considerably more members than the five million Aeroplan members, executives said on the call, pointing to Australia-based Qantas, which has about 12 million members. 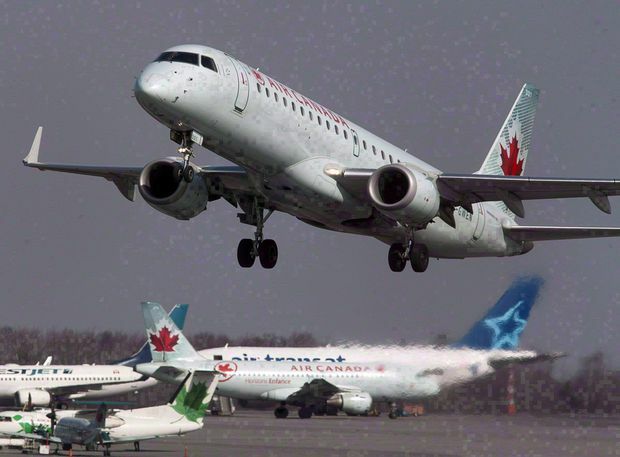 Air Canada reported record revenue of $4.33-billion in the second quarter, but a 31-per-cent increase in fuel prices sent it to a loss of $77-million, compared with a profit of $311-million a year earlier. The most recent quarter included a loss of $186-million on the expected sale of 25 Embraer jets, while the year-earlier quarter included $68-million in foreign exchange gains and $26-million in aircraft sale and leaseback gains. The fuel price jump led Air Canada to lower expectations for the rest of the year for two key financial measurements, including return on invested capital. It’s also studying whether it should cut capacity in the fourth quarter, said Ben Smith, president of passenger airlines. “We are studying quite extensively our capacity plan for Q4 and the last part of Q3 with the view of trimming it where it makes sense,” Mr. Smith said. Capacity as measured by available seat miles rose 7.5 per cent in the second quarter, part of a huge expansion — much of it to international destinations — that coincided with the delivery of 37 Boeing 787 wide-bodied planes, whose lower operating costs mean destinations that previously were too costly for Air Canada are now within range. The airline is also in the midst of taking delivery of new Boeing 737 narrow-bodied shorter-haul planes and will start receiving Airbus A220 (formerly the Bombardier C Series) narrow bodies next year.